I’m about to head off to Europe for five glorious weeks of adventure and discovery. I won’t be wandering solo, but I still want to travel safe, and I’m sure there will be times on my trip when I’ll be doin’ my own thang. I know that as a woman, this unfortunately comes with some risks. This thought scared me—being in a foreign country, not knowing the language, possibly being lost on the streets and only having the faintest idea about various cultures. I was like, damn, I better be careful. 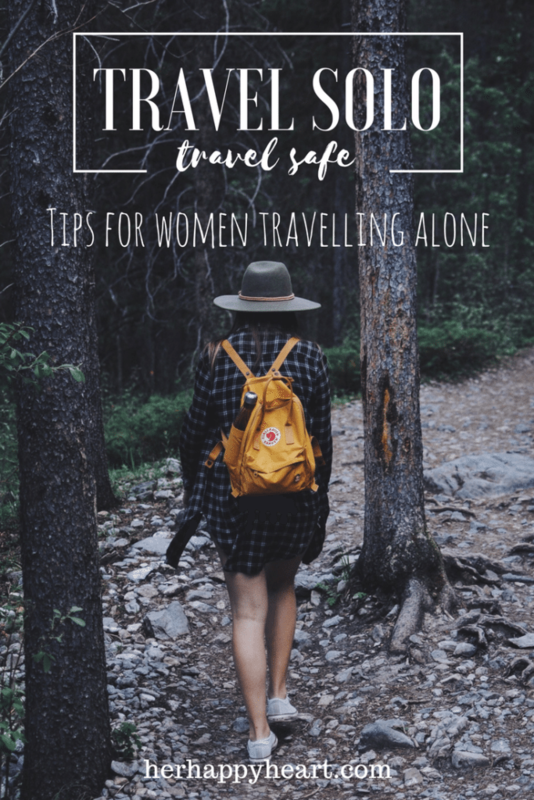 Travelling alone should be no different for males and females, but sadly, this isn’t the case. Theft and harassment are the two major concerns. Us women have to be on our guard more in order to travel safely, but that doesn’t mean we have to be paranoid—just clever. It’s a smashing idea to leave a copy of your itinerary (if you have one) with someone at home, like a parent or trusted friend. That way, they can track your movements and know whereabouts to find you if something goes wrong. My parents and my husband’s parents each have a copy of ours. Furthermore, make an effort to check-in regularly and tell people where you are. Okay, so, I already have a real wedding ring, but if you don’t, I’d recommended getting a cheapie and chucking it on. We all know that some men can be very forward and confronting (ew), particularly if they think you’re alone. Do anything you can to make them think otherwise. Lie convincingly, confidently and without hesitation. Flash that ring right in their retinas and hit them with lines like, my husband is meeting me here soon, or, my husband is John Cena. Pretending to be married will keep some of the weirdos at bay. Do you look like a tourist? You better check yo’self, girl. If you’re in Paris, don’t be wearing a shirt that says “I Love Paris”, ya know? Try to dress like a local if you can, you want to blend in as much as possible—tourists are splendid targets for pickpockets. Those slippery gypsies will sneak up on you if they think you’re a foreigner who is likely carrying an expensive camera and a wad of cash. Speaking of pickpockets, make yourself aware of popular scams and keep a watchful eye out. Tourist Scams and Rip Offs alone comprises a helpful list. I was surprised at how often this little tip popped up in my quest for safe travel. Always act confident, even if you’re not. Walk with your head high, shoulders back, look straight ahead and walk with purpose. If you’re lost, try not to look lost. Don’t stand in the middle of the street gawking at a map—gracious, what did I just say about blending in? Nip into a shop, take a seat and check your location privately before moving on. Again, the façade of confidence will make you appear more like a local, and make you less vulnerable to snakes (criminals). If you need to ask for directions, be smart about it. Approach a family or a group of women, be particular in what you say. Where is . . . ? I’m meeting my husband there, who is a three time Olympic wrestling champion with a bionic arm that can smash through buildings. Trust your gut. If you think you’re being followed by a creepy-creeper, duck into a café or shop and make conversation with one of the employees until you’re sure your stalker has moved on. Then, call a cab and head back to your accommodation. The number one rule when traveling solo is to avoid drawing attention to yourself, but this rule is void if the situation calls for it. If you begin to seriously fear for your safety, by all means, scream and cry your lungs out. If someone grabs you (a bit morbid, sorry), your best asset is your voice; assaulters want an easy target—there’s nothing easy about a victim who won’t go quietly. It’s a good idea to learn some phrases in the local language for these situations like, help, attack, robber, police, and so on. Remember, the key word is easy, don’t go without a fight! If you cause enough of a ruckus and draw attention to your situation, the assailant will likely run off to save his hide. Try and avoid using a backpack. In a crowded area, the zips and compartments can be easily accessed without your knowledge. If you do need one for whatever reason, wear it on your front where you can see it, and use a little combination lock. Get a bag that goes across your body, not just over one shoulder. Anyone could run past and tear it off, but a bag going across your frame isn’t so easily removed. Even in Perth, I usually have one hand on my bag all the time as it bounces against my hip, a good habit I’ve gotten into for my upcoming trip. It’s also a good idea to purchase a secret bag like this one, one that sits under your shirt, away from prying eyes and deft hands. Take a photo of your passport, credit cards, tickets, accommodation receipts and even the Australian Embassy contact details. Save them to Googledocs or Dropbox, that way, even if your whole bag is stolen you can still access those vital documents. Until you get to know the staff, it’s a good idea to decline the cleaning services they provide. Put the ‘Do Not Disturb’ sign on the door and leave the TV on when you go out to give the impression that the room is occupied. It may seem harsh to be skeptical of everyone, but the truth is, you just don’t know who to trust when you’re in a strange place. Amiright? Yep, I am. 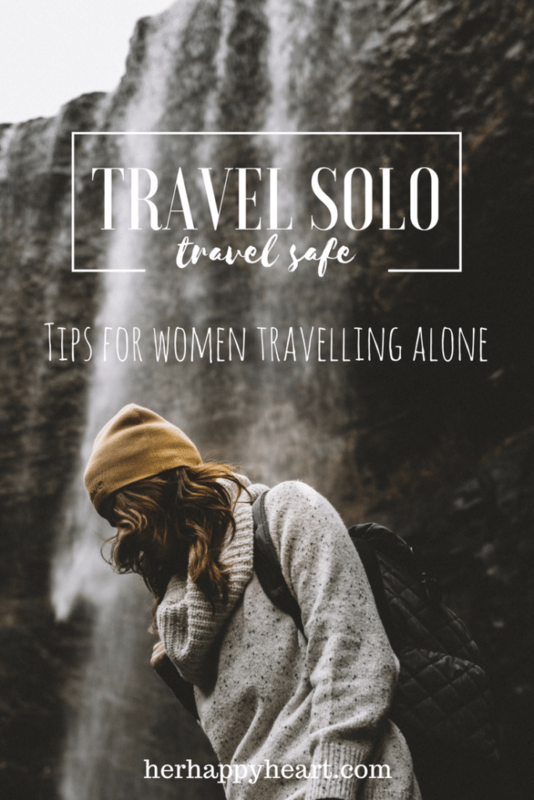 While these tips may come in handy for any explorer, it is particularly important to be safety savvy when you’re a woman traveling alone. A little common knowledge and street smarts will go a long way. Happy adventuring! Ashleigh is one of our regular writers and Her Happy Heart's resident artist. You can get to know her over at our "About Us" page! Some great tips there, Ash. Hope you guys have an awesome trip. Use as much of local language as you can- people really appreciate the effort. Great tips Ash! I found the tripit app useful too – it automatically compiled all my travel details for me directly from my emails! Ahh I love travelling adventures!